I was riding on a stretch of the Salt Creek Trail, when I saw a couple people pulling up plants. I asked them what they were doing. They were pulling up garlic mustard. I talked to them a bit. One of the guys said that the plant was brought over from Europe a while back, and then sort of went all crazy and stuff (my words, not his). They mentioned they were volunteering under the auspices of the Cook County Forest Preserve, and also mentioned a website Restoringnature.org — it’s part of the Des Plaines River Valley Restoration Project. You can volunteer to help at the website. 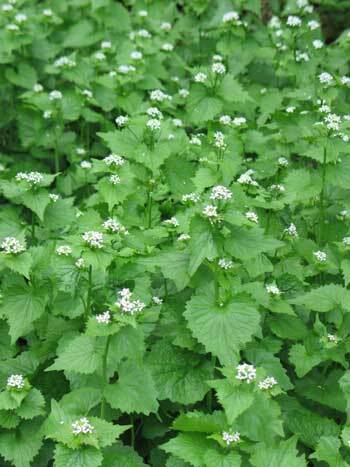 As I continued to ride, I saw TONS and TONS of garlic mustard plants. It made me think of kudzu, and other species introduced by people into natural environments, often resulting in unexpected consequences. I don’t know, it seems that nature does what nature does, and when people are dumb enough to introduce something into an ecosphere, maybe they’re doing the same thing as a bird dropping seeds into an unfamiliar forest. Nature is all about species waxing and waning, landscapes changing, etc. Part of the mission of this organization is to keep biodiversity, but also to restore wildflowers that have lived in the area. Is it worthwhile? Is it a losing battle? A compelling case for volunteering is made here. So, should I volunteer? Should you? Hey, I like garlic and I like mustard. Posted in nature on the march. 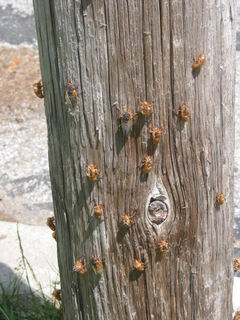 The only reason why I continue posting about cicadas is because they have completely overwhelmed my life. I’m home alone with the kids, so I decide to take them to a park a few blocks away. My daughter and my younger son ride in a wagon I’m pulling, and I’m pushing my older son in a tricycle that has a handle in the back for an adult to push. 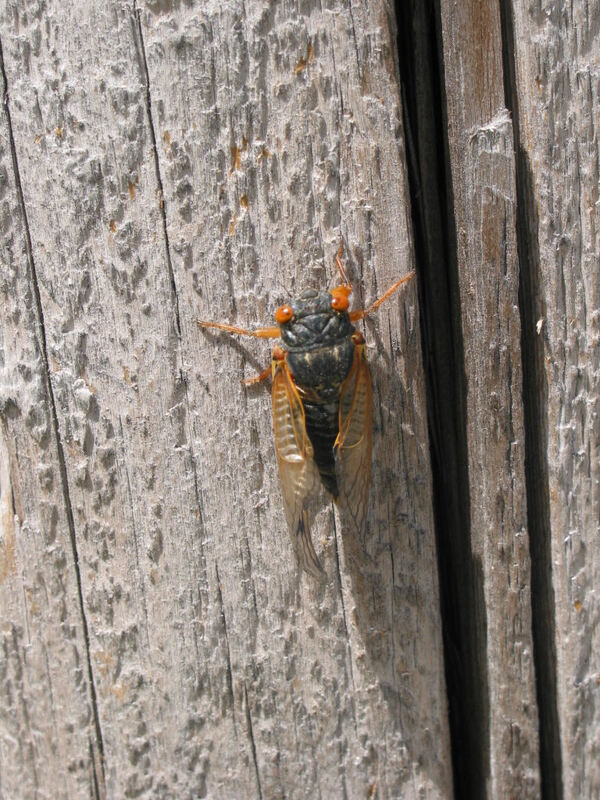 All my other posts about cicadas were nothing, let me tell you. NOW they mean business. Now they are on the ground, on the trees, and flying around. 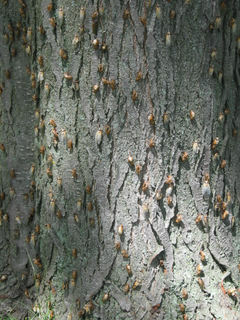 In the back of my mind I knew my daughter did not like these bugs, but it wasn’t until she started screaming, “Cicadas! 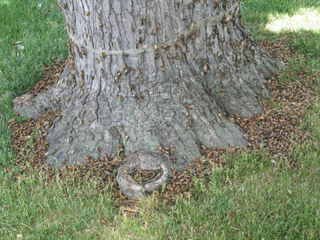 Cicadas everywhere!” that I realized that, hey, she did not like these bugs. 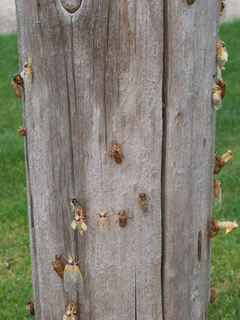 I know all you bug-deprived northern Illinoisans just think I am posting fictitious cicada reports to boost my hits with entomologists, so here are some pictures taken in front of my house. 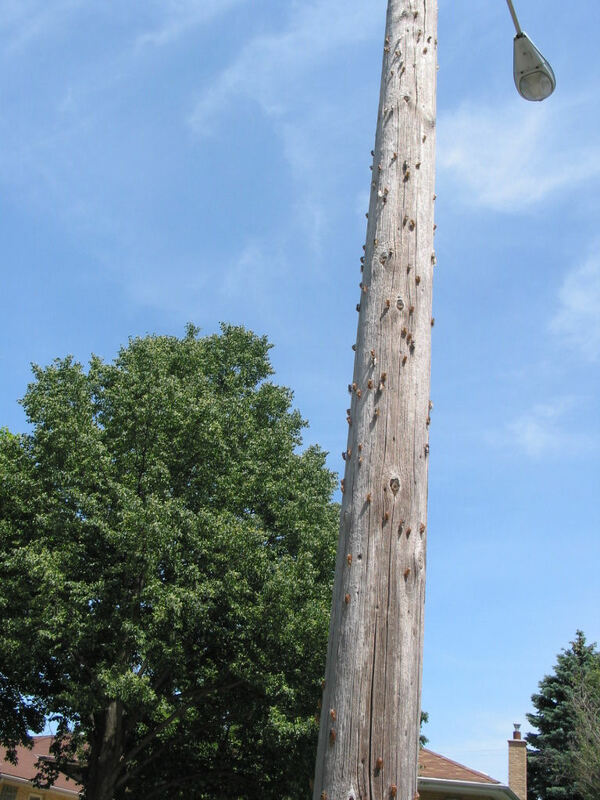 The light pole in front of my house. Closer on the light pole. Another view of the light pole. Yet another view of the light pole. One of them buggers close up. Detail of a tree in front. The base of the tree. Who wants pork cracklins? 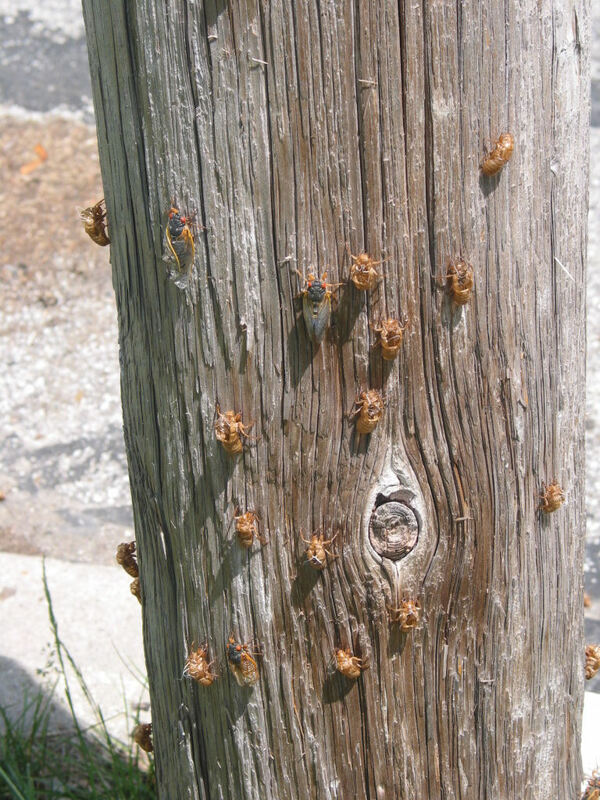 Posted in cicadas, nature on the march. 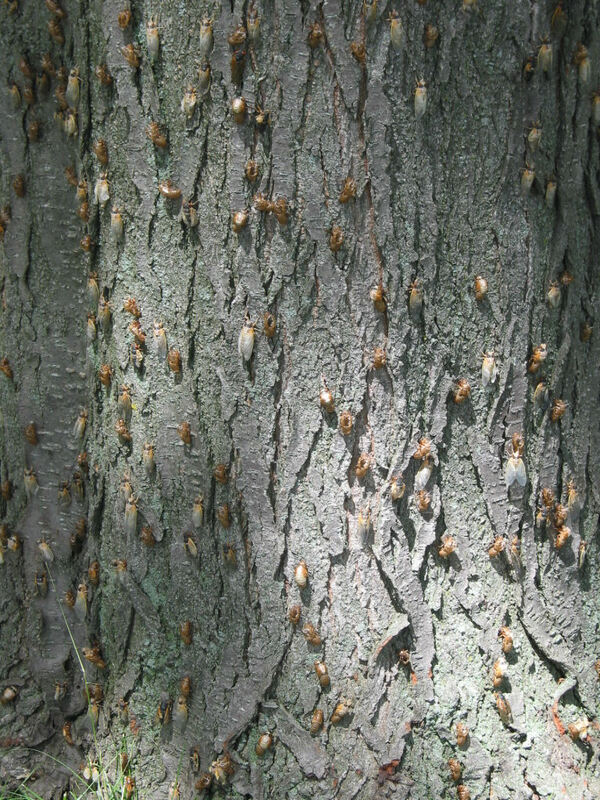 It might just be that it’s 15 degrees cooler today, but there weren’t nearly as many crunchy cicadas for me to step over on the one mile walk to my train this morning. Could I be nearing the final stages of the cicada grief cycle? 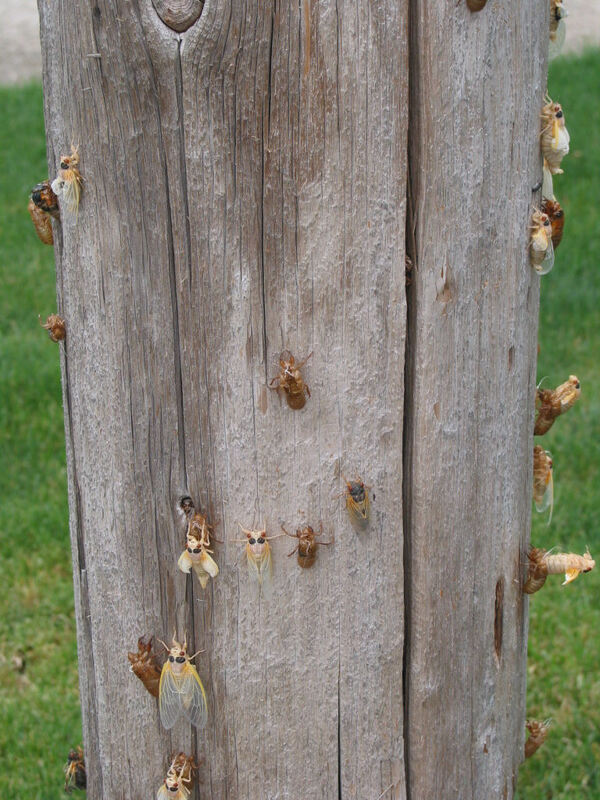 Please note, this isn’t the cicada cycle used by everyone. Take an impending bug invasion, and reading bedtime stories to my kids, and what do you get? There was once a velveteen cockroach, and he was really splendid. He was brown and blotchy, with long feelers and skinny little legs. On Christmas morning, he sat wedged in the bottom of Boy’s stocking. He was a gag gift from Boy’s weird uncle. There were other things in the stocking, nuts and oranges, a toy engine and a velveteen rabbit, but the cockroach was the best of all. But Boy thought the cockroach was ugly, and dropped him in his toy box. Boy played with Rabbit for two hours. Then Aunts and Uncles came to dinner, and the cockroach and the rabbit were forgotten. For a long time, the cockroach lived in the toy box. He was naturally shy, and being a cockroach, all the other toys shunned him, especially Rabbit. Even the toy horse, who was usually nice to everyone, wouldn’t talk or look at him. One evening, when the Boy was going to bed, he couldn’t find the dog that always slept with him. Nana was in a hurry, and grabbed Rabbit for Boy from the toy box. “Here,” she said. “Take this bunny. You can sleep with him.” And she put Rabbit in Boy’s arms. Nana also saw Cockroach. “What a disgusting toy,” she thought to herself. She took him and threw him in the trash outside. Nana did not see that Cockroach bounced out of the trash onto the dirty ground. Boy and Rabbit grew very close. They did everything together. Sometimes they would walk past Cockroach, who was getting dirtier and dirtier, and was very, very sad. As time went on, and Rabbit was very happy, he didn’t notice his fur getting shabbier and shabbier. For the cockroach, who still lay on the dirty ground, sadness gave way to hate. One day the boy grew very ill. Nana took the rabbit because the doctor said it was full of germs, and threw it in the garbage when Boy was sleeping. Cockroach looked at Rabbit. In a dirty leg he picked up a tiny shard of glass. Cockroach crept toward Rabbit, who was starting to cry because he missed Boy. With a quick slash, Cockroach sliced Rabbit from his neck to his tummy. “Barrgggghhhhhhhh!” said Rabbit. He was dead. Cockroach grabbed Rabbit’s carcass and pulled it over his insect body. 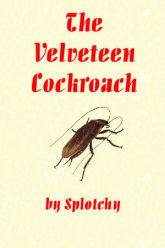 As Rabbit’s pelt settled onto Cockroach’s head and back, a tear dripped from Rabbit’s fur on to the dirty ground. From where the tear fell on the ground, a mysterious flower grew. A blossom opened and a lovely fairy stepped out. “Do you know who I am, little bunny?” she asked. She waved her wand, and in a flash, Cockroach was real! “What the?” the toy fairy said. “Rabbit? Rabbit? Hmm. This usually works.” Fairy shrugged her shoulders and disappeared in a shower of sparkles. Autumn passed and Winter, and in the Spring, when the days grew warm and sunny, boy was in his kitchen. Boy grabbed a dictionary and smashed the bug into goo. But he never knew that it really was his own Cockroach, come back to look at the child who had first helped him to be Real. Posted in dreadful reimaginings, nature on the march, products i'd like to see. For those in the Chicago area, look forward to being blessed with many, many bugs in the very near future. Those planning weddings or family reunions this spring may want to watch out for May 22. 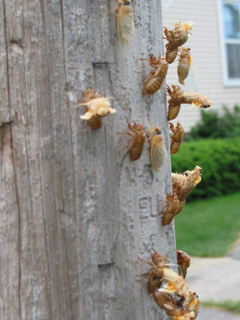 That’s the date, a prominent cicada researcher is estimating, that the little red-eyed bugs will emerge in the Chicago area. Specifically, the evening of May 21 and early morning hours of May 22. Some may emerge a few days earlier and some stragglers may crawl from the ground a bit later depending on sunshine and shade, but the May day is “the big day,” said Gene Kritsky, an entomologist and author of several bug books, including Periodical Cicadas: The Plague and the Puzzle. 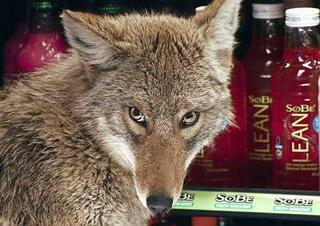 “Sandwich lovers beware — the most famous non-cartoon coyote in America is back on the loose. 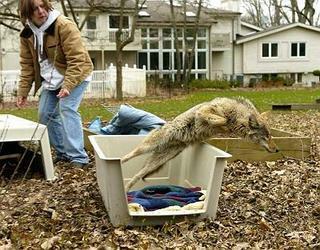 Adrian, the lost coyote that wandered into a Loop Quiznos sandwich shop Tuesday and settled into its bottled drink cooler for 45 minutes, was released in northwest suburban Barrington Hills Wednesday. “So a coyote walks into a Quiznos . . . Sounds like the start of a joke. It’s not — although dozens of downtown folks got a good laugh out of it Tuesday.